In 2007 over 400 million equity option contracts were traded but it is a volatile market, prices are ever changing with supply and demand – the only certainty is that they will change. With little knowledge or experience, an uninformed decision can quickly drain capital. 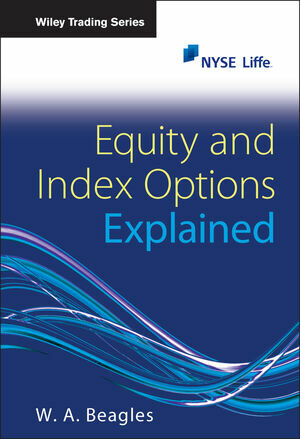 This book explains equity options from absolute basics, assuming no prior knowledge of the subject. It shows traders starting out and already using the exchanges how to enhance their equity portfolio by using the whole range of investment opportunities and tools available. This will help investors to reduce their costs, enhance returns and manage price risk with certainty and precision. Equity Options Explained is a practical guide to trading equity options, supported by Liffe (part of the NYSE Euronext exchange group). Written by Bill Beagles, a well known, highly experienced trader and trainer, creating a unique combination in this area. Bill is still highly active in the markets, which brings a practical perspective to his training and the books. W.A. Beagles graduated in economics in 1984, before starting his City career with Lloyds Bank as an FX trader and going on to help establish the bank’s presence on the LIFFE trading floor. In 1986, Bill joined AOT, a specialist option trading firm, for whom he traded a range of option products on LIFFE and LTOM in London, the MATIF in Paris, the EOE in Amsterdam and the electronic DTB (fore-runner of Eurex) in Germany. Following in the footsteps of many successful traders before him, Bill “went local” in 1994, making markets in the FTSE 100 Index option on LIFFE. When the open outcry trading floor closed in 2000, Bill had the honour of ringing the closing bell for the final time. Joining up with Simon Hart and Andy Swaine, two long term friends and fellow traders, Bill then set up K2 London, a trading company that combines day-to-day derivatives trading with fund management, education and consultancy. Since 2000, Bill has provided specialised education and consulting services to a wide range of institutions including LIFFE and the LSE in London and to a range of government agencies and major companies across the globe. Bill’s combination of current market knowledge and educational experience allows him to present the complex subject of options in a clear and intuitive fashion. Preface: Trading Language and Products. 5 Option Price and Value. 9 Option Pricing Revisited: the “Greeks”. 13 Long Call Spreads (Bull Call Spreads). 14 Long Put Spreads (Bear Put Spreads). 15 Short Call Spreads (Bear Call Spreads). 16 Short Put Spreads (Bull Put Spreads). 17 Selling Naked Puts versus Selling Put Spreads. 18 Long Verticals versus Short Verticals. 27 Short Call Calendar Spreads. 28 Long Put Calendar Spreads. 29 Short Put Calendar Spreads.